A nanny is a person whom you hire to look after your children in your absence. Before hiring a nanny, there are some things which should be cleared between the nanny and the client so that no conflict could occur in the future regarding the duty or fees or any other thing. For solving all these issues, people often sign a nanny contract with the nanny in which all the conditions from both the sides are mentioned in detail. Here we are going to describe some Sample Contracts for a nanny so that you can clearly understand the concept. 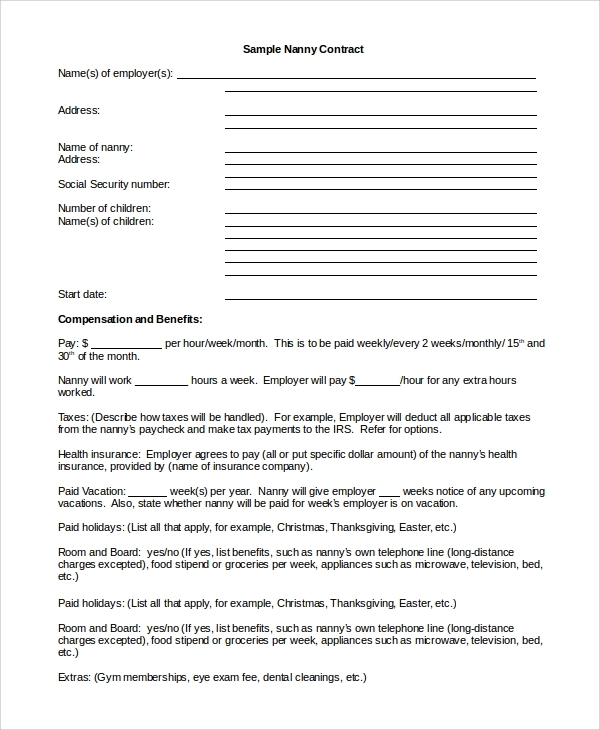 This is a basic nanny contract in which all the details of the nanny, parents and child are mentioned. Working hours, fees, place of work all are mentioned in the contract with all the specific details. 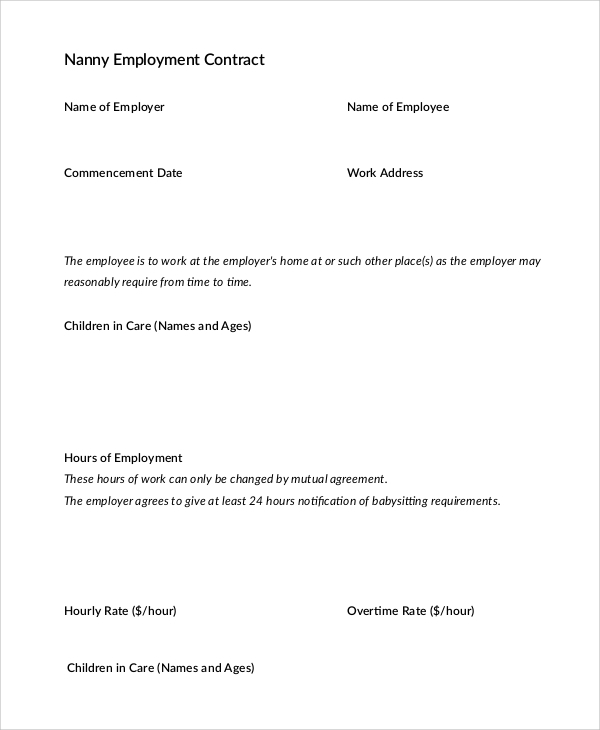 This nanny contract agreement is signed between the placement companies of nanny and the candidate who is applying for the task. The company will ask for all the details of the candidate with the proof so that no legal trouble can occur in future. All the conditions and norms of the company will be clearly mentioned in the agreement. 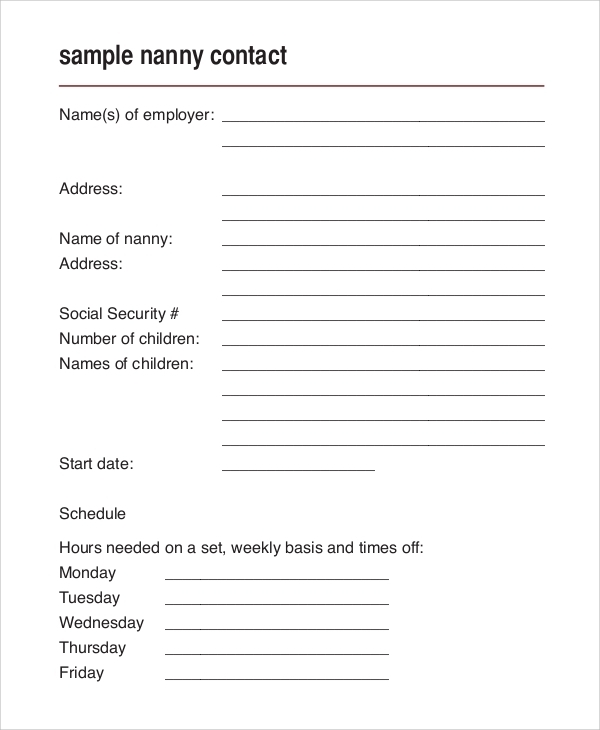 In the nanny contract, all the details like name, address of the nanny should be mentioned. 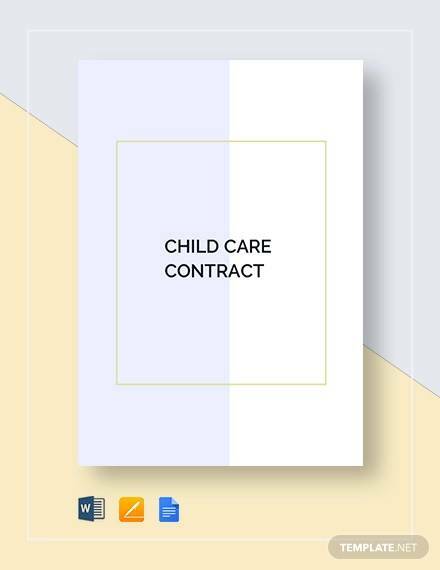 The working hours, the number of children to be handled, duties, compensation, schedule, parent’s expectations, over time, etc., all these essential topics are discussed in the contract. 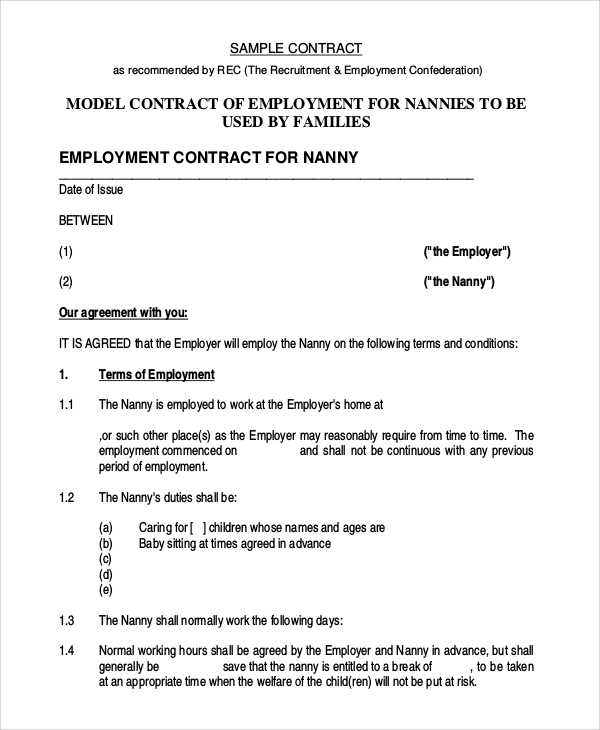 This nanny contract is made between the hiring company and the nanny. 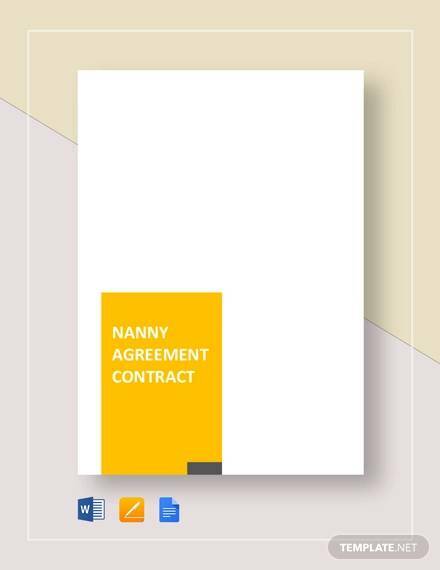 The nanny should carefully understand all the terms and conditions mentioned in the contract and then sign the contract because the contract is finalized, she cannot back a step. The form will ask the name, address and phone number of both the parties i.e. the nanny and the parents. All the details of compensation, holidays, etc. are going to be present in the form so that no confusion will be there between both the parties. Why Signing Nanny Contract is Important? Sometimes it might be possible that the person you are hiring as a nanny for your child is completely unknown to you and giving your child’s responsibility to such an individual will be quite difficult for you. 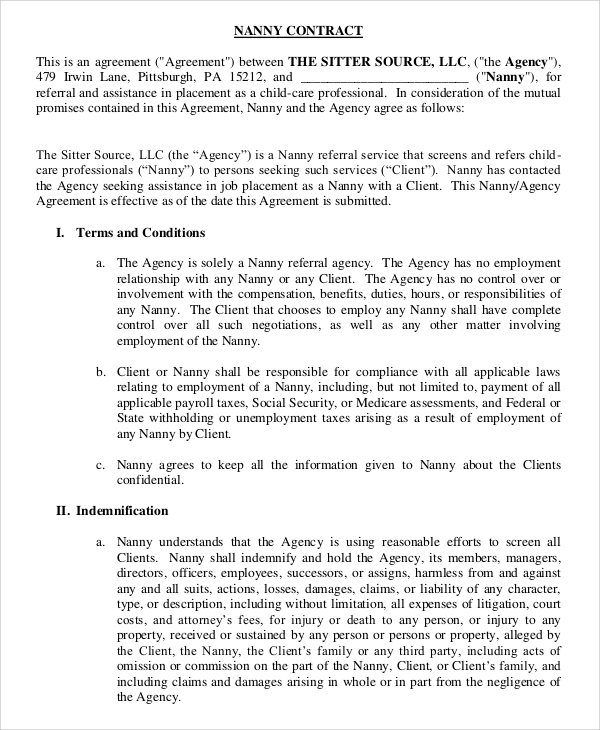 If you sign the Nanny Contract Samples with the nanny, then you can get all the information about her and her background with the legal address proof. Once the contract has been finalized, she cannot utter a word against you regarding working hours, holidays, fees and other things. Some things are important to finalize on papers to avoid any future consequence. So, always make a nanny contract before hiring someone for your child. What are the things that should be Mentioned in the Nanny Contract? There are some things which are mandatory to be included in the nanny contract to avoid conflicts or trouble in future. First of all, always ask for the address proof of the nanny and complete background information about her as you are going to hand over your child to someone who is completely unknown to you. Try to grab all the essential information which is important for you to know about her and do not forget to discuss the number of holidays, fees and extra time in the contract because she can irritate you and can bound you to not to go on your work as she will take a number of holidays by herself. 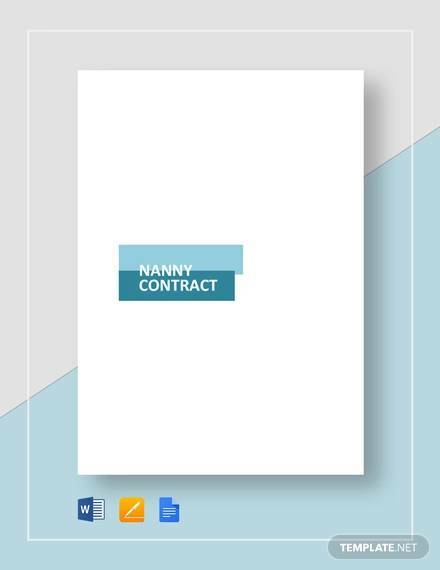 All the important samples of the nanny contract are discussed here. Try these things to implement in future while making a contract with a nanny. All the things which should be included in the contact are mentioned with all the details. The Sample Sales Contracts are also available on the internet, so just google them to clear your doubts about it.